Hello, friends! I hope you all had a great weekend. My parents came to visit and we had so much fun, especially Sutton! Sutton LOVES her gammie and papa and was screaming running through the house once they arrived. She has to be by papa’s side the entire time, it’s the sweetest thing. My mom and I were able to get pedis, grab lunch and do some shopping while Sutton and the boys stayed home and napped. It was so nice to spend some one on one time with her. Later, we went to a local food truck festival and had so much to eat! Sutton was so cute, she had worn her purse and kept trying to go up the the food trucks and give them her money. She is getting so big! The weekend just seemed to fly by! How did you all spend yours? I am so excited to be sharing this look today. It’s my absolute favorite as of late. The colors of this tunic and cardigan are so pretty for fall. I have worn this cardigan pretty much nonstop since I got it. The cardigan sold out since I posted last week, but I found it fully stocked in all sizes here. I wouldn’t wait on this one! I am wearing size small in both tops. 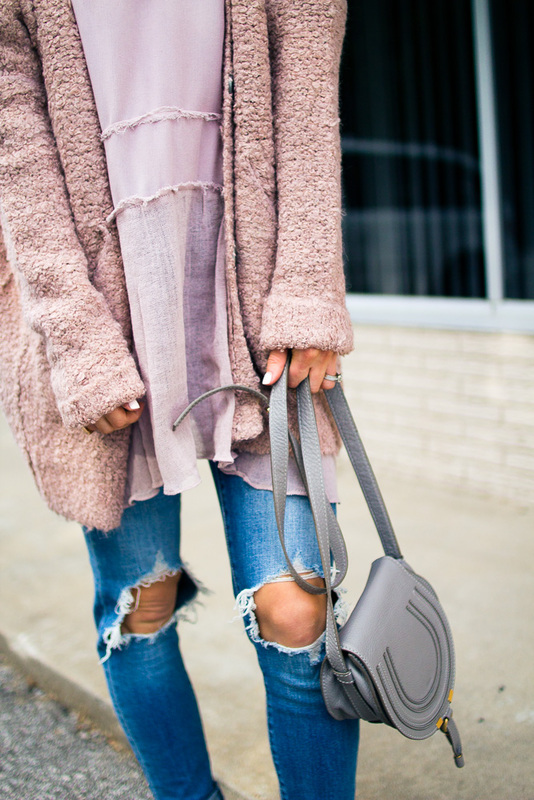 Love this oversized pink cardigan! Love it! This sweater looks so comfy-cozy! So pretty! I love the colors!!! WOW! I love this. Such a pretty color and it looks so soft! Perfect for those cool mornings or evenings.